No, not the cartoon cat and mouse duo. They came after, probably inspired by the drink, which was apparently a particular favorite of President Warren G. Harding. The story of the drink begins with a British writer named Pierce Egan. He’d published a book and a play. It was 1821, and the book was called Life in London, or The Day and Night Scenes of Jerry Hawthorn Esq. and his Elegant Friend Corinthian Tom, which you’ll have to agree is one of the most amazing book titles of all time. Egan reportedly concocted the “Tom and Jerry” drink to publicize the book and play. While outside the confines of Wikipedia Jerry Hawthorn, Esquire, and his elegant pal Corinthian Tom have been largely lost to history, the holiday drink still holds strong… in Minnesota and Wisconsin, mostly. That’s where it came into my story. 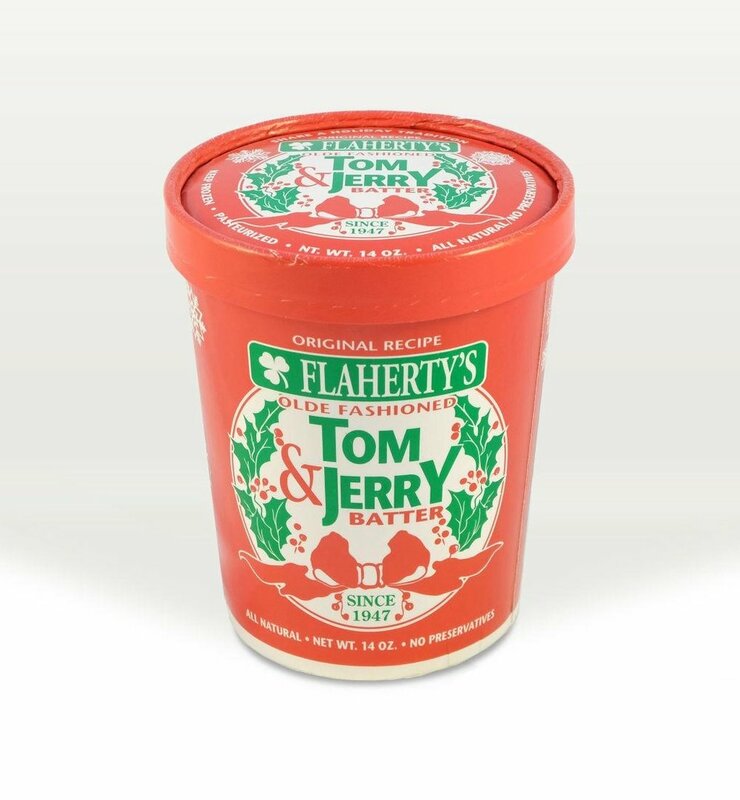 When I was a kid growing up in Minnesota, around the holidays, my parents would sometimes make these incredibly delicious drinks called Tom and Jerrys. They tasted like hot frothy spiced eggnog, but better. Though they were indeed special to the holidays, they weren’t terribly hard to come by. In November and December, you could easily find pre-made Tom and Jerry batter in those freezer cases at the supermarket. They looked like little red ice cream buckets. All you had to do was scoop some into a mug, add hot water (and optionally liquor), and PRESTO. Christmas in a cup. Anyway my parents would make non-alcoholic versions for us kids and brandy-and-rum-laced versions for themselves. And the memory of their inimitable deliciousness has always stayed with me. Over the years, I’ve tried without success to find the pre-made batter in supermarkets in Virginia, California, and Colorado, thinking all the while, how can everyone not know how good these things are? And so alas, the last Tom and Jerry I enjoyed — that last steaming mug of thick, sweet, nutty froth — remained ensconced somewhere in the 1980s. After hearing my Tom and Jerry musings, John decided to figure out how to make them from scratch. He watched YouTube videos and read through recipe after recipe. He experimented on Thursday night, with John asking the memory of my 10-year-old self, “Does this taste right?” (It did.) 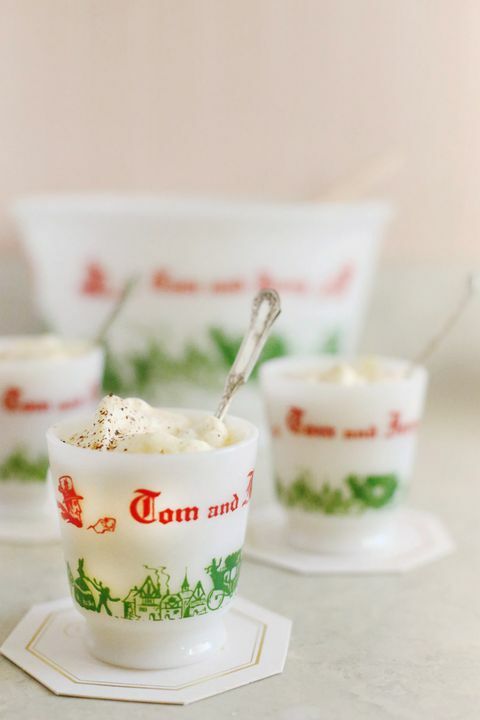 And on Friday, when we had some friends over to celebrate the holidays, he proudly served up Tom and Jerry after Tom and Jerry inside my grandma Violet’s silver-gilded teacups. Below is the recipe he figured out. I’m happy to report they were indeed delicious. I hope they’ll become a holiday tradition for us. Anyway, I wondered if you’d like to try them, too. In a large bowl, add cream of tartar and pinch of salt to egg whites. Beat until stiff. Add 1.5 cups confectioner’s sugar. Beat until very stiff. In a separate, smaller bowl, combine cinnamon, ground cloves, allspice, and vanilla. Add egg yolks and beat together. Fold yolk mixture into egg-white mixture. At this point, it should have the general consistency of pancake batter. To serve: Using a large spoon, add two generous spoonfuls of the combined mixture into a small mug or teacup. Add 1/2 ounce brandy and 1/2 ounce rum. Top with freshly grated nutmeg. Serve warm.